The Beta 91 is a boundary mic intended for use inside a kick drum. 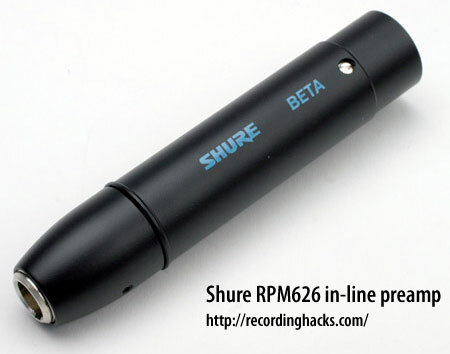 It uses the mic capsules from the Beta 98; the RPM108 cardioid capsule provides a half-cardioid response in the Beta 91. Presumably the RPM110 provides a half-supercardioid response. The case is metal (zinc alloy). The grille is steel, finished in matte black. It ships with an inline preamplifier (p/n RPM626), soft case and a 15' detachable mic cable. The jack on the mic case appears to be a 4-pin TA4M; the supplied cable is a TA4F to TA4F (mini-XLR female). The RPM626 preamp has a TA4M on one side and XLR on the other, for use with standard mic cables. The Beta 91 was discontinued in 2010, with the release of the Beta 91A. 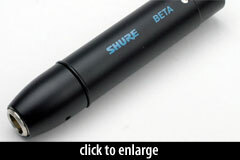 The Shure Beta 91 is also known as: Beta91, Beta 91.